If you pine for those days when a mobile phone battery could last a day or so without a recharge then there’s some good news for you. 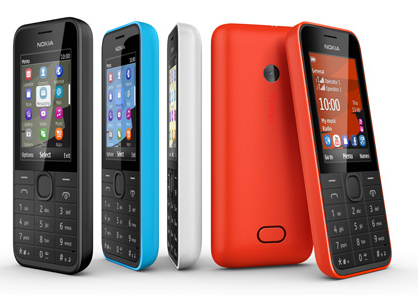 Nokia today unleashed a trio of new mobiles which have battery life of, wait for it, 33 days on standby. Nokia 207 and Nokia 208 are non-touch screen chocolate bar design mobiles that are aimed at users who still want a smartphone experience on a cheap and small device as they are both 3.5G HSPA compatible. They do however boasts email, WhatsApp messaging (and if you are wondering what that is click here) Facebook and Twitter apps. There’s also basic web access too, with Nokia’s Xpress Browser compressing data for a smoother, and apparently faster web surfing experience. The third phone is a dual-SIM variant of the Nokia 208, which enables you manage two separate SIM plans on a single device. “The Nokia 207 and Nokia 208 are designed for people who like a classic phone and traditional keypad but don’t want to miss out on smartphone experiences, like staying connected to social media and accessing the Internet,” said Timo Toikkanen, executive vice president, Mobile Phones, Nokia. Expect to pay $68 USD (around £45) for the Nokia 208 and Nokia 207 when they start shipping during the third quarter of 2013. Nokia haven’t revealed pricing for the dual-SIM variant yet. For that money they could moonlight as your second phone on the occasions when you need to leave your super expensive mobile at home.